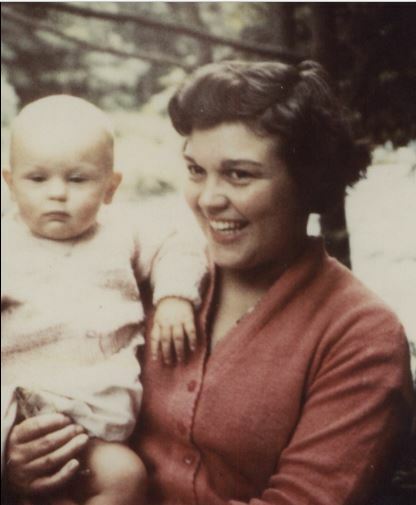 Mam is a great woman, warm and funny, impulsive but practical; she guided me through my childhood in a rush; always at speed, her cooking was accompanied by clashing pans, housework was finished at the double and daily shopping was completed in between other tasks as she wizzed (her word) out on her bike for bread or fish. When her youngest child was at school (my brother) she went back to work, and for a couple of years picked up the job she did before her marriage, working part time in the local tax office as a clerical officer. Clearly a bad career choice, she strained against the tedium, the routine, the sameness of it all, and in her forties took a decision to retrain. She loved children (not just us) and loved stimulating their play; our house being the gathering place for most of the neighbourhood on most days; so her choice to train as a nursery nurse was the right thing to do. A two year part time course followed. Project based, with placements at local nurseries and schools, she qualified with flying colours. And she did. A few months later she started working as a classroom assistant in a local primary school and was there until her retirement, wizzing through her days cutting out cardboard and pinning up paintings, lunch duties and playground patrols, and just being there – as she always has been for me. And through my life her words have stuck with me. In my work now I see many mothers, all with the same balancing act of dreams versus responsibilities. Some mothers I work with get the thing they are seeking relatively quickly, but some have a bigger dream, or a more distant one, and it takes longer. And sometimes I think. Am I doing my job right? Did I help this person on the right way? Is it right to encourage this person in a dream that they have not yet attained? Then I get an email or a card, from just that person I am thinking about, and worried about. They are writing to tell me that they have got that job; that their career is finally on track. They thank me, and tell me that they were so happy that I had belief in them, and that they could not have achieved this without my support. Thank you for writing to me, and stroking my ego by saying my work with you was valuable. But thank my Mam too. I know how strong she was, and I know that strength is in all of us. I remember the time during her studies. I cleaned the house every Saturday from top to bottom before going to watch Newcastle United play!! And amazingly she did all the family shopping on her bike! thanks Penny, I remember doing the cooking! She would leave the ingredients out for me with a note on how to prepare it all.